Why did I keep that? The story of a sock drawer. 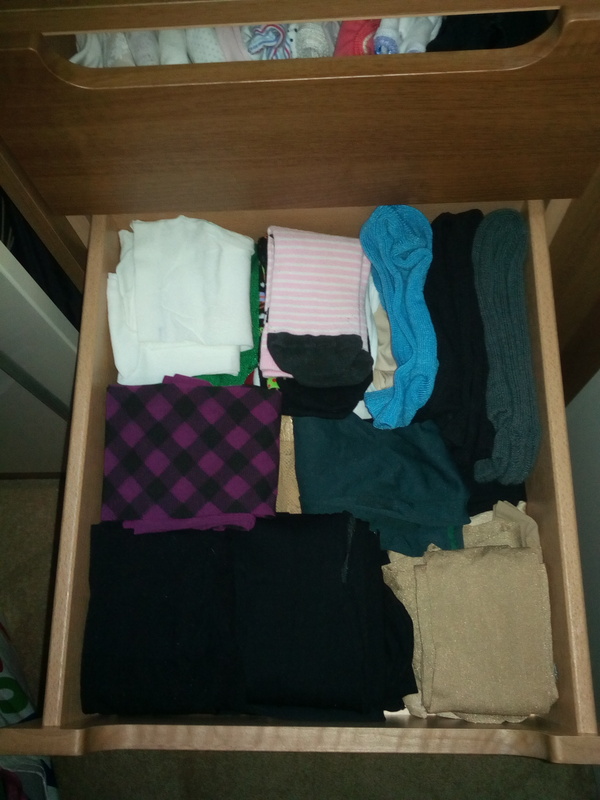 You may be wondering, reader, why I have started this post with a picture of my sock drawer. Yes, and tights drawer. And above it, my underwear drawer. Note the regimented row of pants. I like a tidy drawer. But until yesterday, my sock/tights drawer was anything but. It was overflowing with pairs of tights I never wore and socks I will describe as childish. And one pair that didn’t even fit. I will at this point state that novelty socks are perfectly okay under the right circumstances, such as Christmas or when you’re feeling kooky. Novelty socks are never acceptable under an office setting, no matter how casual your dress code. Anyhow, yesterday, with the aid of a glass of prosecco, I decided to sort out this abomination of an overflowing drawer. And I was surprised at how much I got rid of. For years the sock drawer had been rammed full, mainly because of the mentality that it was somehow ‘wrong’ to dispose of anything inside it. The irony being, of course, that I preach about keeping your wardrobe tidy. Somehow, I had forgotten about sock drawers in that statement. The mentality that it’s ‘wrong’ to get rid of things is the one I find most prevalent among the people I help. I’m not sure if it’s a comfort thing (I know it, so I’ll keep it because I feel safe), a thrift thing (I paid for it, I can’t get rid of it because that’s wasting money) or the famous ‘just in case’ argument (I might need it one day). Believe me when I say I understand all three of these. It’s a huge problem in my family, and with several of my friends. As I was sorting through my piles of socks and tights, I realised that while I could apply the logic of disposing of something I no longer wanted to clothes, it was strangely harder with socks. After all, they go on my feet, and I’ll always need something to go on my feet. Wrong. I didn’t need ten identical pairs of black tights or my old navy blue tights from school. Fluffy pom pom socks? In another life, maybe, but I’m 35 now. It felt good to give myself permission to turf out things I had kept for literally decades. I ended up with a pile of unwanted tights, horrible thin pop socks and old hiking socks that were almost crunchy to touch. They’re all being taken to the fabric recycling bank and I won’t be sorry to see them go. I recommend that everyone has a good sort out of their underwear and sock drawers. I think we neglect them when it comes to editing our wardrobes. You might be surprised at just how many socks or tights you own, and how old some of them are. Apply the same rules to the drawers as you would to the wardrobe – does it fit, does it suit you, does it serve you – and your sock drawer will be as neat as your wardrobe. ← New year, new you.